These days, I’m trying to find healthy meals for weekdays that don’t leave me starving and miserable. This bowl is jam packed with flavour from the dressing, a kick from the olives and all of the health benefits of the veggies and farro. In a large bowl, combine the farro, cucumber, peppers, tomatoes and parsley. To make the dressing, combine all of the ingredients except the oil. Gradually whisk in the oil until the mixture is emulsified. Season with salt and pepper to taste. Pour the dressing, little by little over the farro mixture, until it is the desired consistency. You may not need all of the dressing, but it keeps for several days. For the shrimp, preheat a grill pan to high. In a bowl, drizzle the shrimp with olive oil and salt and pepper and give them a toss. When the pan looks like is starting to smoke, add the shrimp. Cook on both sides for 1 minute, until opaque and subtle grill marks appear. 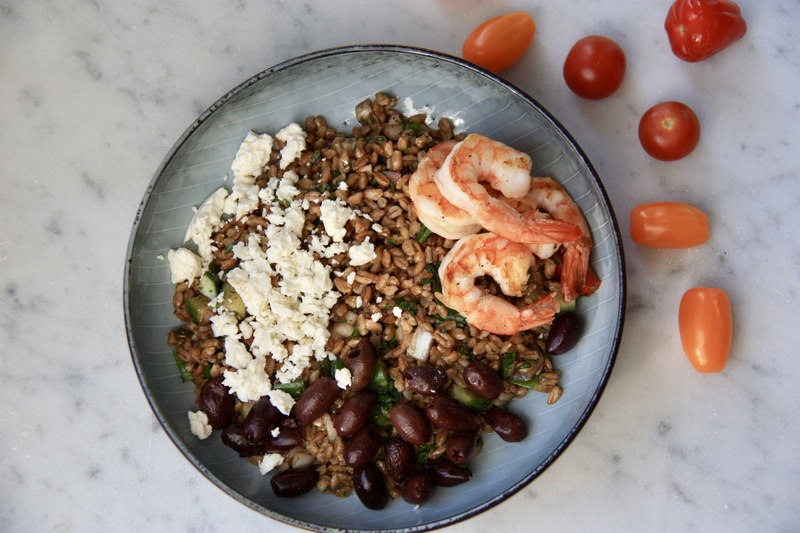 Divide the farro between 4 to 6 bowls. Top with the olives, feta and shrimp. Serve and enjoy!